Whilst the majority of human DNA is identical between individuals, there are some regions where sequences are known to vary. This variation can occur anywhere, and is often found in repetitive DNA that doesn’t have a coding function. Thus, each individual’s DNA is unique. DNA can therefore be used as a method of identification, much like a fingerprint. The first step of DNA fingerprinting is obtaining a sample of cells that contain the DNA of interest. This sample usually comes from blood, skin or hair follicles. The DNA is extracted from these cells and purified. 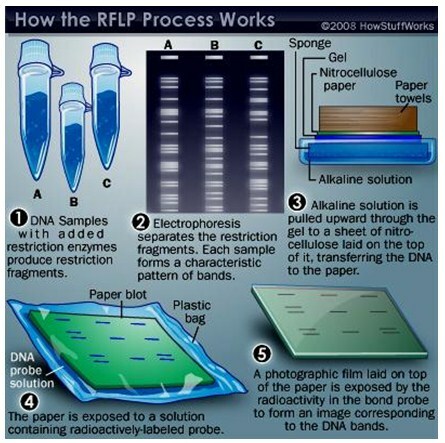 When DNA fingerprinting first began, it was based on a technology called restriction fragment length polymorphism (RFLP). RFLP relies on the use of enzymes from bacteria (called restriction enzymes) that cut DNA only at known, defined sequences. For example, the enzyme HindIII will cut DNA every time it finds the sequence AAGCTT. Variation in human DNA sequences means the enzyme will cut at different points for different individuals. To visualize this cutting variation, the fragments of DNA are separated by electric current on a gel, a technique called gel electrophoresis. This method separates out fragments of DNA, because shorter fragments move faster down the gel than larger fragments. Different sizes of fragments will have been produced by the enzyme, depending on how frequently it finds this sequence. The separated DNA fragments are then blotted onto a nylon sheet, and exposed to radioactive probes that match the DNA complementary to the sequence you want to visualise. The radioactive probes bind to complementary sequences that have been run on the gel and blotted (by a process called Southern blotting), and X-rays are used to expose the film, allowing scientists to visualize the pattern of fragments (and hence the DNA unique pattern of that individual). This technique requires lots of high quality DNA, which is often difficult to obtain from crime scenes. Thus, the technique has been modified and surpassed by other methods such as polymerase chain reaction (PCR) and short tandem repeat (STR) analysis. PCR mimics the DNA replication inside the cell, but on a specific region of interest. This allows researchers to amplify particular regions of DNA, making multiple copies of a particular region. This gives them more DNA to work with, meaning even tiny tissue samples or partially degraded DNA can be used for analysis. It can even amplify partially degraded DNA. To conduct PCR, the purified DNA is incubated with an enzyme and primers specific for the region of interest, and subject to various temperature incubations to create multiple copies of the fragment of interest. This is most often applied to regions of the genome called short tandem repeats (STRs), also called microsatellites. STR profiling is still widely used as a method of DNA identification. 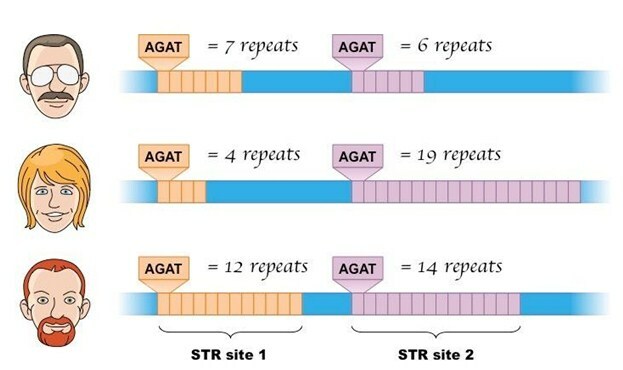 STRs represent repetitive regions of the genome, which have sequences made up of repeating units of nucleotides (usually 2-4 nucleotides in length). The number of these repeating units differs between individuals, and can therefore be used as a way to carry out DNA profiling. PCR is used to amplify a specific STR, creating thousands of copies of the fragment that researchers can compare the length (based on how frequently the repeating unit is repeated) between individuals. Between 5-20% of the population will share any particular fragment length, so how can it possibly be used to reliably distinguish between two individuals? The power of the analysis comes from comparing several of these loci, usually around 10. Another factor to keep in mind is that humans carry two copies of every piece of DNA (two alleles), one from our mother and one from our father, and the number of repeats of each STR in each copy that we inherit can differ. A statistical calculation based upon the 13 FBI-determined STR allele frequencies reveals that the probability of two unrelated Caucasians having identical STR profiles, or so-called “DNA fingerprints,” is approximately 1 in 575 trillion! Therefore, it is a reliable way to identify an individual. This image illustrates how individuals can differ in repeat numbers at 2 different STR sites. 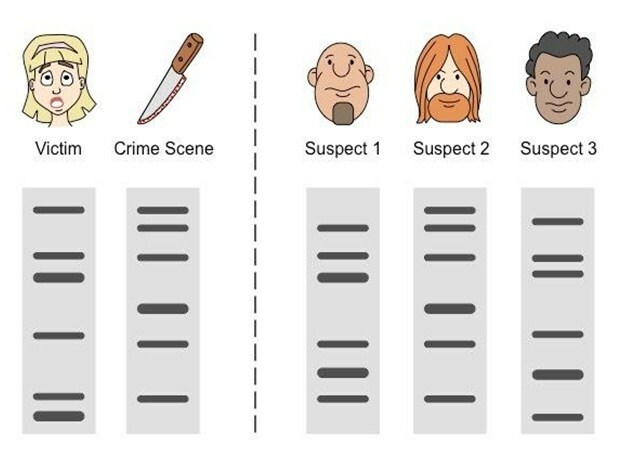 The image shows DNA profiles taken from a victim and a crime scene, compared to 3 suspects. Each line represents a different size of fragments generated from enzymes cutting the STR sequences. The fragment length differs between individuals due to the variation in the length of their repeats. The fragments are separated using gel electrophoresis, with smaller fragments moving more quickly through the gel matrix. Thus, the fragments you can see closer to the bottom of the image are smaller than the fragments at the top. These unique profiles can be compared to build a picture of who was present at the crime scene. In this example, Suspect 2’s DNA matches the DNA at the crime scene.